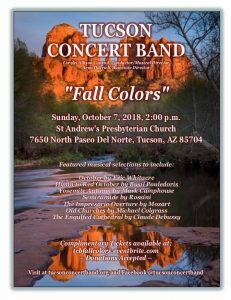 The Tucson Concert Band begins its 52nd season with music reminiscent of fall colors, including October by Eric Whitacre, Hymn to Red October by Basil Pouledoris, and Yosemite Autumn by Mark Camphouse. Our program also includes exciting opera overtures such as Semiramine by Rossini and The Impresario Overture by Mozart. To complement the beauty of the venue, our program also features Old Churches by Michael Colgrass and The Engulfed Cathedral by Claude Debussy. The Tucson Concert Band is joined by Navy Band Southwest to pay tribute to St. Patrick's Day with a concert of "Jigs, Reels, and Fairy Rounds."